This outstanding example of a 2019 Mercedes-Benz E-Class E 300 is offered by Mercedes-Benz of Scottsdale. This Mercedes-Benz includes: HEATED FRONT SEATS Split Bench Seat Heated Front Seat(s) Fixed Bench Seat Bucket Seats NIGHT PACKAGE BLACK BLIND SPOT ASSIST Blind Spot Monitor PANORAMA ROOF Generic Sun/Moonroof Sun/Moonroof Dual Moonroof BLACK, MB-TEX UPHOLSTERY Vinyl Seats Cloth Seats Leather Seats Premium Synthetic Seats HEAD-UP DISPLAY Heads-Up Display 12.3" WIDESCREEN INSTRUMENT CLUSTER AMG LINE EXTERIOR 4-Wheel Disc Brakes Front Disc/Rear Drum Brakes PREMIUM 1 PACKAGE Keyless Start HD Radio Hands-Free Liftgate Satellite Radio Power Door Locks Keyless Entry Remote Trunk Release BURMESTER SURROUND SOUND SYSTEM Premium Sound System *Note - For third party subscriptions or services, please contact the dealer for more information. * You deserve a vehicle designed for higher expectations. This Mercedes-Benz E-Class delivers with a luxurious, well-appointed interior and world-class engineering. 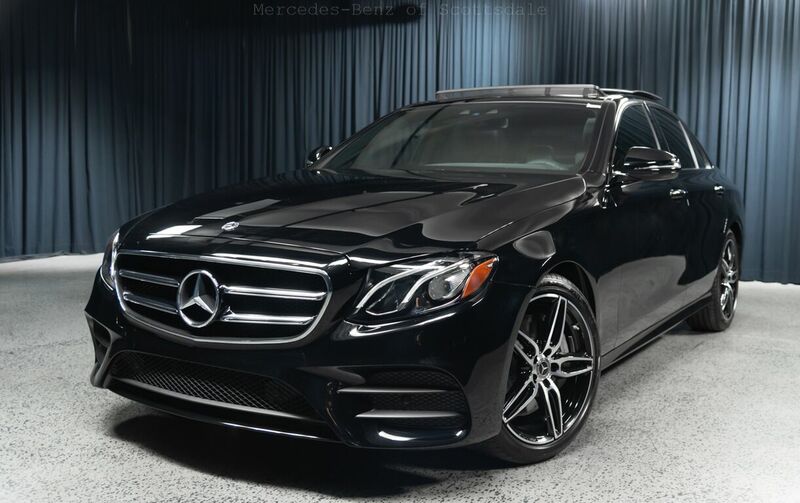 Marked by excellent quality and features with unmistakable refined leather interior that added value and class to the Mercedes-Benz E-Class Contact Mercedes-Benz of Scottsdale today for information on dozens of vehicles like this 2019 Mercedes-Benz E-Class E 300. There's a level of quality and refinement in this Mercedes-Benz E-Class that you won't find in your average vehicle. The look is unmistakably Mercedes-Benz, the smooth contours and cutting-edge technology of this Mercedes-Benz E-Class E 300 will definitely turn heads. Just what you've been looking for. With quality in mind, this vehicle is the perfect addition to take home. Based on the superb condition of this vehicle, along with the options and color, this Mercedes-Benz E-Class E 300 is sure to sell fast.